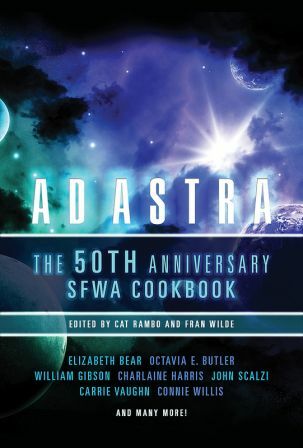 Ad Astra: The 50th Anniversary SFWA Cookbook edited by Cat Rambo and Fran Wilde is available for preorder now. From Alien Scones to At the Fruitcake of Madness, DOOM Cookies, Falling Cloud Cake, and Miss Murder’s Black Forest Trifle, there are 157 dishes and how-tos from 134 writers, editors and agents. Blogosopheric evidence exists that this cake recipe may be Rachael Acks’ contribution. The project follows a SFWA tradition, says Cat Rambo, established by two previous cookbooks, both edited by Anne McCaffrey, Cooking Out of This World and Serve it Forth. The pre-order price is $20, good until June 1, and those who pre-order by that date get free shipping. Copies, including digital, will arrive in mid to late June. All proceeds are being donated to the SFWA Legal Fund. I just want to register my deep disappointment that Lois McMaster Bujold did not contribute a Butterbug recipe. I assume Scalzi will be serving up either Schadenfreude Pie (yay) or Bacon Cat (ewwwwwww)? Snowcrash, I’ve seen the galleys and think you’ll be happy.